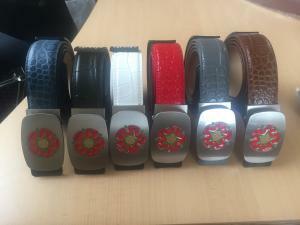 Friends of Real Lancashire have teamed up with Druh Belts UK and are giving you the chance to purchase a leather belt with a silver buckle on which is an embossed Lancashire Red Rose. Druh’s designs in classic black and browns and funky pastels and metallics have fast become the professionals’ style secret, with the likes of Lee Westwood, John Daly, Robert Karlsson, Paul McGinley and Thongchai Jaidee joining 100s of European and Asian Tour players, as well as LPGA and LET players, in choosing Druh belts. Each belt is handmade using the finest in sustainable and natural materials. Leather and snakeskin straps are matched to Druh’s unique range of interchangeable buckles, which gives Druh customers the opportunity to create their own customised belt to look smart.